The origins of Yoga go back 4000+ years. Yoga has moved with the times, and the kind of Yoga that is practised with Antonia Boyle and her guest tutors is certainly relevant to the 21st Century. Always in the front of our mind when we plan courses and lessons is: “How is this relevant today?” The answer must always be in the order of: It is relaxing. It is health giving. It relieves stress. It is empowering. It makes me strong. It keeps me flexible. It is for all ages and abilities. Maybe most of all: It makes sense. It must make sense. It is straightforward, it is a lesson in well being and not some obscure mumbo jumbo! 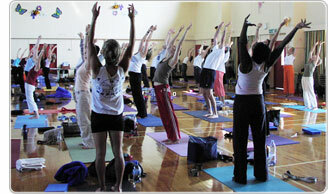 In our view Yoga is the most holistic of all personal development systems. It takes care of the body’s structure, the internal organs, the state of mind, the immune system and the spirit. See for yourself.